Private Customized Tour - Experience the island's best sights - Dole Plantation, beautiful beaches, Halona Blowhole, Movie Spots and a Macadamia farm. Most important: Have fun & feel ALOHA. We help you customize the perfect tour. and many more possible locations! Customize your tour with DanielsHawaii. Your guide will meet you at 9am in front of your Waikiki hotel, and take you on a full-day island adventure that hits the Oahu hot spots. Because the tour is completely customizable, you can pick from over 30 locations that sound most interesting to your group, whether that's starting the tour at Diamond Head lookout and driving to Halona Blowhole, or visiting the set of your favorite movie before strolling a hidden beach. Hear the legend behind Chinaman's Hat as you drive up the windward coast, or stop at the Polynesian Cultural Center to experience the history of the islands. Head to Haleiwa town for some shopping and local food, but not before stopping at Waimea Bay and visiting the famous North Shore. Because your local guide is in tune with the seasons and rhythms of the island, they can let you know where the best spot might be to go whale watching over the winter, or where the waves might be breaking that day if you want to check out the surf. You can stop at the popular Dole Plantation—where most of the tour groups go—but also visit smaller farms, like macadamia or shrimp farms. Even if you just want info on the island your guide can tell you some local favorites of where to eat back in town, or how to avoid the crowds when spending a Waikiki day at the beach. 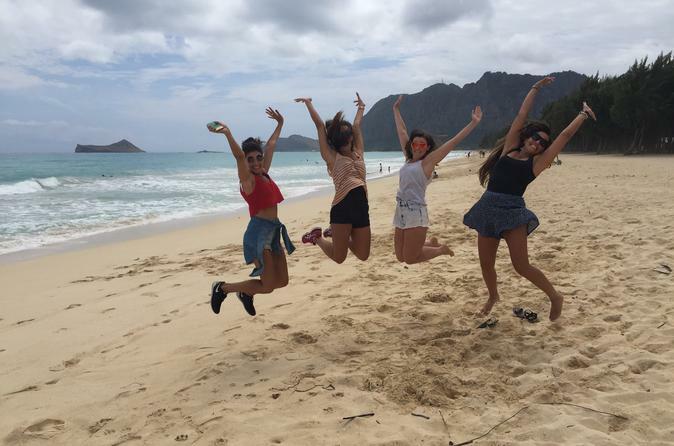 However you choose to spend the day, your tour will finish back in Waikiki after a full day of exploring the island. If you like to upgrade your tour, your guide can snap photos and video of your trip you can keep as a souvenir.